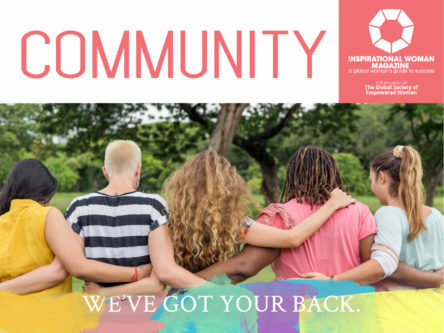 1) SMT Enterprises, Inc. 2) 3 Ladies Agra Inc.
Inspirational Woman Magazine (IWM) speaks to the needs, thoughts, experiences, and perspectives of women from around the world through the eyes of others from around the world. IWM is thematic and published quarterly. Living the 360 Life with Angela Martindale – How to find balance in Work, Play, Fitness, and Nutrition and achieve better health. Ideal for small to mid size companies or organizations who seek to provide workplace wellness, improve company loyalty, reduce burnout, fight desk fatigue, inspire self change, motivate the team, and increase staff effectiveness. This 60 minute presentation takes the boredom out of wellness and adds sizzle to how great we can live. I Am Angela Martindale – The Power of Being You. Explore the factors that define or limit our perceptions of who we are, what we feel like, what we believe about ourselves, what we can achieve, and who we can become. Learn how to see and feel just who you are…just exactly how great you can be. This 45 minute presentation is loaded with self affirmations, goal setting, simple self growth steps/techniques, and inspiration all about you. Feel the Power of You! Perfect for young women, women organizations, and women based groups. The age of empowerment – At what age are you truly an empowered woman? Does your current belief system motivate your Chief Aim? Is being empowered in business different from personal fulfillment? What are you doing to manifest your goals? Are your goals making you feel good now? What does being an empowered woman really mean to you? If you represent an organization that would like to secure Angela Martindale to speak at an event: Please fill out the Speaking request form. Valerie Bihet founded VIBE in 2004 With more than 20 years of experience in the event and destination management industry. Since then, the former Communication Director at Disneyland Paris and Club Med North America has led the agency in producing more than 1,100 events for Fortune 500 companies. For more information visit www.thevibeagency.com To connect with Valerie directly through TheGSEW, click here! After receiving her medical degree and studying abroad, Dr. Murad observed many different cultures. She then found that her mother was having serious health issues related to her circulation. Unfortunately, seniors are often unable to follow an exercise program, so an alternative solution was required. Dr. Murad developed a technique that achieved great results. The program incorporates full-body circulation and begins with movement in the toes and fingers. It can even be done with a patient who is lying down. This program is based on sound scientific principles related to the heart and circulation and aims to de-stress the heart by using a series of specific finger and toe exercises. After Dr. Murad’s mother’s successful recovery, a friend’s mother, who was suffering from heart-related problems tried her Program and the results were impressive. The program is particularly beneficial for seniors who are prone to heart-related illnesses and executives who sit for long office hours. It can also help get seniors off of their medications. To learn more about this revolutionary program, please visit http://movementisblessed.com. My greatest professional accomplishment is melding the art in my soul with the science in my head; and finding the perfect outlet for these vastly different yet complementary disciplines in my profession as an Aesthetic Nurse Specialist. When people look back at my life, I hope they remember me as an awesome mom, a good friend, thoughtful, kind to others, non-judgmental, and perpetually optimistic. I strive to align with the following mottos everyday: “Treat others as I would like to be treated” “Do my best at everything I do” “Be present in the moment; and enjoy each day” What is one thing that most people are not aware of, that you would like them to know? Becoming an Aesthetic Nurse Specialist is not an easy journey. There is no formalized institutional training. There is a steep learning curve to becoming a master injector; it takes years of practice and time before patients will trust you completely with their faces. Establishing a reputable practice and building a client base can take years of diligent work. What advice could you offer fellow members who want to work in your area of expertise? Pursue the best education and training that you can find! Ask others in the industry to give referrals and recommendations as to which trainers are reputable. Don’t quit your day job as you pursue aesthetic training; it may take years to get yourself established in the aesthetics industry. Click here to read Connie's full article in the Communication Issue of Inspirational Woman Magazine! "I would advise them to not try to “act like a woman” as in trying to be liked by people through conforming to what is feminine (from job to behavior) but to love themselves unconditionally; to not repress their true personalities just because some may not think it is “feminine” but to express their full potential, sexuality, and personalities; to realize how strong they are; and, most importantly, to be unconditionally loved by themselves first, and everyone else will follow. Also, I would advise women to emphasize cooperation, to seek out women mentors, to find motivating role models, and to thrive to grow in every possible way. Be passionate in everything you do, be a woman who impels, inspires and empowers. It is the most incredible gift you can give to another." To connect with Hasmik Arakelyan directly through the GSEW, click here! Madge was the Chief Innovation Officer and Technology Fellow at State Street Corporation, where she served as Executive Vice President for over a decade. During the past year, she represented State Street as a consultant assisting MIT Collaborative Initiatives to bring innovative solutions to problems broadly ranging from global sustainability to health, education, and veterans’ reintegration. Madge has been recognized with 16 personal awards for her industry and community achievements, including Bank Systems & Technology “Elite 8 Innovators” and Bank Technology News “10th Annual Innovators List,” which both honor executives who leverage innovation for competitive advantage. Under her leadership, Madge’s teams at State Street were also recognized with 32 awards for innovation and excellence, including 12 IT environmental sustainability honors. Madge was also recently initiated as a Simmons School of Management 2013 Chapter Honoree into the International Beta Gamma Sigma Honor Society as a leader in business and management. She is currently a member of Simmons College School of Management Business Advisory Council, the DNA Medicine Institute Business Advisory Board, and several advisory boards for venture capital and non-profit institutions. Madge believes passionately in making innovation “Business-as-Usual” – to continually develop and implement new ideas or solutions that create business value and increase competitive advantage. Madge also held executive positions at Merrill Lynch and IBM and serves on several boards in industry, academia, and nonprofit institutions. Nominate women of outstanding accomplishment and distinction.